The Montreal Canadiens scored four third-period goals to come from behind and beat the Ottawa Senators 5-2 on Saturday night. A controversial no-goal call in the third period helped spark the Canadiens' come-from-behind victory over Ottawa. Montreal scored four goals in the third to beat the Senators 5-2 on Saturday night for its fifth win in six games despite having another one disallowed earlier in the period. With the game tied 2-2, it appeared the Canadiens had taken the lead when Phillip Danault redirected the puck behind goalie Mike McKenna, but the goal was waived off when the referees called an embellishment penalty on Artturi Lehkonen, who passed the puck to Danault while falling to the ice on a hook by Thomas Chabot. Both Lehkonen and Chabot went to the box and the game stayed tied. "We were a little upset and we transferred that energy the right way actually," said captain Shea Weber. "It was a good reaction. Guys were really upset. We thought we deserved a goal there. But we did the right things and came back and played the right way." 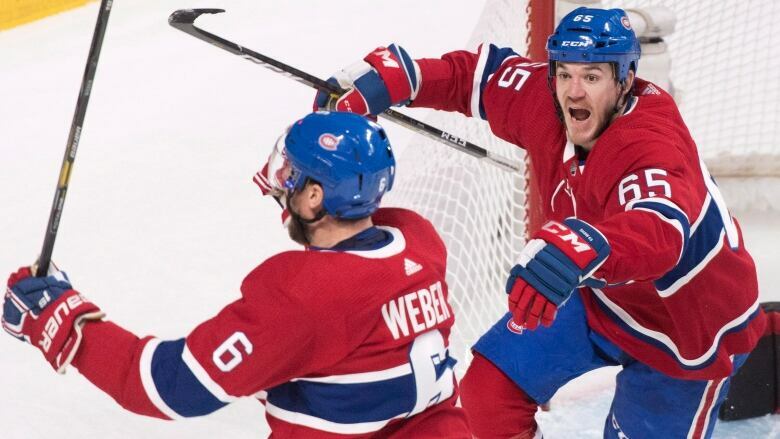 "They were fired up and we were fired up," said Weber of the Bell Centre crowd. "It was a good intensity and energy for everyone. It was definitely loud." Paul Byron made it 4-2 at 13:37 when he redirected Jesperi Kotkaniemi's shot past McKenna. Jonathan Drouin sealed it with an empty-netter at 17:31. "We were all upset," said Claude Julien, who earned his 600th career victory. "You can disagree with bad calls. I consider that one a mistake more than a bad call. I wish they would have gotten together and overruled that. It would have made sense. Montreal (17-11-5) has defeated Ottawa (14-16-4) three times in the past 12 days — all three by the score of 5-2. The Senators have dropped six straight contests in Montreal. Ottawa was coming off a 4-2 win against the Detroit Red Wings on Friday and the visitors showed signs of fatigue. "We let them come at us in waves and we didn't have a match for their energy and the amount of pucks they put on the net," said forward Bobby Ryan. "We sat back a little too much. We were a stick length away all night. The Senators dropped to 2-4-1 in their past seven games. Carey Price extended his personal winning streak to five games by stopping 16-of-18 shots. Price improved to 25-9-5 all-time versus Ottawa. At the other end, 35-year-old journeyman McKenna did what he could to hold off the Canadiens, stopping 42 shots in relief of Craig Anderson. With his second goal in as many games, Matthew Peca got the Canadiens on the scoreboard at 3:39 of the first period. Montreal's lead was short-lived, with Colin White netting the equalizer 20 seconds later. The Senators scored on their first shot of the second period at 9:11 after the restart. Confusion between Jordie Benn and Noah Juulsen behind their own net led to Mikkel Boedker's fourth of the year. The home team tied the game at 2-2 just 2:06 into the third period. Kotkaniemi's wrist shot rang off the iron, then hit McKenna in the back and trickled across the goal line.